Gooey Peanut Butter Cups stemmed from my initial attempt at making Peanut Butter Truffles. To quote Yogi Berra, “It was déjà vu all over again,” because, just as my Gooey Brownie Cups came from a Cookie Dough Truffle mess-up, so too did this Cup recipe. Weeks ago, my goal was to make Peanut Butter Truffles. Easy enough, or so I thought. I had been making cookie dough truffles recently and figured that the peanut butter ones would be terrific with a cookie dough base. I was wrong. I realized that I don’t want to crunch sugar when eating a peanut butter truffle. I want to enjoy the creaminess that peanut butter offers when it is surrounded by a delicious robe of chocolate. So there I was with a batch of crunchy dough and nothing to do with it. What’s a gal to do? Get creative! 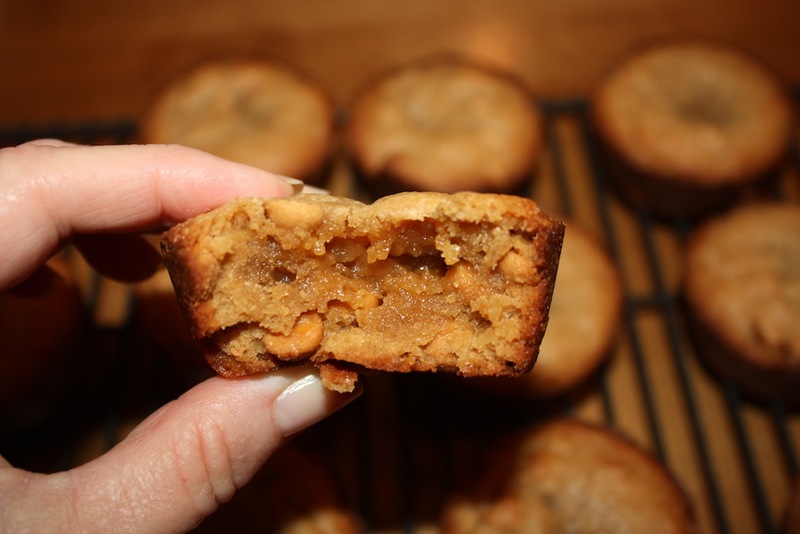 I added eggs and peanut butter chips to the dough, which I then scooped into a muffin tin. Out of the oven came 12 tempting Gooey Peanut Butter Cups. The taste was definitely what I wanted, but I was not thrilled yet with the consistency. Some friends loved them (although one did point out that they were missing chocolate!) while others thought they were too dry. I do not have the tolerance for a dry peanut butter experience! I decided to melt the butter and sugars together in the microwave and then add the remaining ingredients. That light bulb in my head went on very quickly and I couldn’t wait to get back in the kitchen to bake up a batch. I thought the salt would make these cups even better, but it did not. The consistency changed and I was not as happy with them. So I went back to the second version of Gooey Peanut Butter Cups and passed them around to friends. One friend summed them up beautifully when she said that they are, “Incredibly Addicting.” Good luck eating just one. If you are successful, then I commend you on having more will power than I.
Preheat oven to 350°. Set aside a 12-cup muffin pan. Place the butter, sugar and brown sugar into a large microwaveable bowl. Microwave until butter is completely melted. Be sure to use oven mitts when removing from microwave as the bowl will be very hot. Whisk to blend ingredients together. Cool for 10 minutes. Whisk in peanut butter, followed by vanilla, then flour. Continuously whisk mixture while adding eggs, to prevent cooking the eggs. Lastly, use a wooden spoon to mix in peanut butter chips. Some will melt, but most will still hold their shape. Spray pan with non-stick cooking spray. Use a large cookie dough scoop or a gravy ladle to evenly transfer batter to muffin cups. Bake at 350°, on the middle rack of the oven, for 18 minutes. Remove and cool for 10 minutes on cooling rack. Use a small metal spatula to go around edges of Gooey Peanut Butter Cups. Remove from pan and serve warm or cool completely before refrigerating. I made the gooey chocolate brownie cups today and thought since I am in a cooking mood why not try the peanut butter ones too. I had all the ingredients except the reese’s chips. All I had were peanut butter and milk chocolate chips. I remembered that one of your food critics thought that chocolate was missing from your sample so I decided to use what I had. They are a HIT!!! I am sure they would be just as good without the little bit of chocolate but why omit:) I do want to add that using plain chocolate chips would probably be too rich. My batch made 18. Do you fill the muffin section or just use one scoop? I am so glad that you added the chocolate chips! When I posted a question on Facebook asking people to let me know if they preferred peanut butter OR peanut butter and chocolate, the overwhelming response was PB&C. I love that this recipe is so easy to ‘fix’ for those who want chocolate. They need only add the chips! My cookie dough scoop transfers about 3 tablespoons of batter at a time. If you end up with more than 12 Cups, just adjust the baking time down a bit to still have the ‘gooey’ middle. Just made them, but I did it in mini muffin pans. 24 the recipe you gave and 24 with the addition of mini chocolate chips. Both are very yummy, and if you can’t do without the chocolate, they are just as wonderful with the mini chips added. My husband is going to be very happy!!! I am so glad Susan! I did not even mention the option of baking Gooey Peanut Butter Cups in a mini-muffin tin. So glad you did! You made my day. Great feedback and thank you for taking the time to write! !